Something in the Water? Mengele? Darlene and Darles Volkweis. Most of the twins are fraternal. Tatiane, left, and Fabiane Grimm, of the São Pedro area. Tânia Moelmann holding Kiara, left, and Yasmin. High atop a hill behind his family’s home, Derli Grimm knelt and took a sip from a thin black tube leading from a natural spring.Cândido Godói is a farm town. 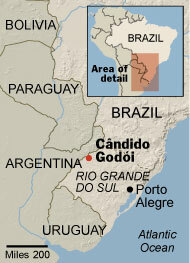 The Cândido Godói Journal article on Monday, about the unexplained proliferation of twins born in the farming town of Cândido Godói in southern Brazil, misstated the type of twins usually associated with a genetic tendency of the mother. 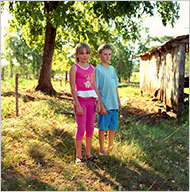 They are fraternal twins — like a majority of those born in the town. They are not identical twins, which are generally believed to be conceived by chance. A version of this article appeared in print on February 23, 2009, on page A11 of the New York edition.